Like many kids, Rachel Buske grew up playing video games and watching sci-fi movies, and she unleashed her creativity by making costumes out of staples and felt. Owning a small business certainly wasn’t on her young mind. But after attending college and entering the workforce, something changed. She needed a new creative outlet. One that was inspired by the things she loved growing up. And one that offers an alternative to fast fashion while making a difference in the world. 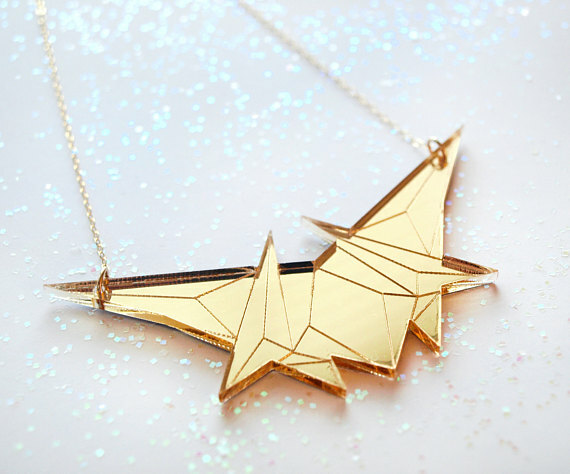 So Rachel launched Galactic Affair, a line of geometric jewelry, in 2014 and opened an Etsy shop to sell her designs in 2015. Here’s her story. After graduating from SCAD Atlanta with a BFA in fashion design and getting some graphic design experience from studying design communications in Nashville, Tennessee, Rachel got a desk job for a manufacturing company, which gave her a lot of opportunities for growth. The challenge: How could Rachel stand out with her own brand using the skills developed at school and through her time in the workforce? Since her education was in fashion design, she originally planned to open a clothing store. 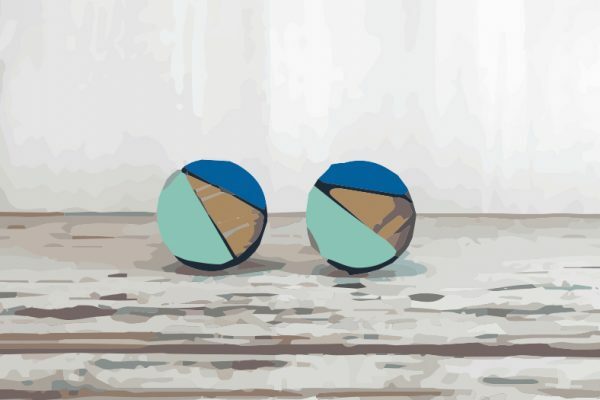 For any maker who wants to make a product to sell, it’s imperative to have a unique style that cannot be found either at mass-market retail or other small business marketplaces. Rachel believes ingenuity and creativity are the keys to running a successful design-based business. “I have always prided myself on being able to set myself apart from the crowd, never doing something that I feel would make me a ‘sell out,’” she says. “I also believe in sticking to my own style, not trying to imitate someone else’s. And that’s the brand message I am curating. 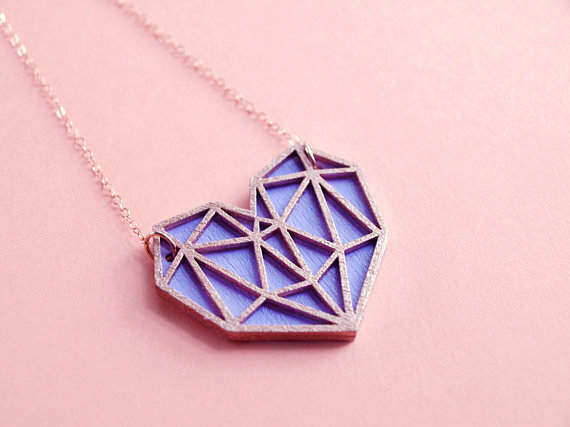 Most of the designs at Galactic Affair have Rachel’s own geometric aesthetic, using both laser cutting and laser engraving on acrylic and combining it with precious metal chains and findings. 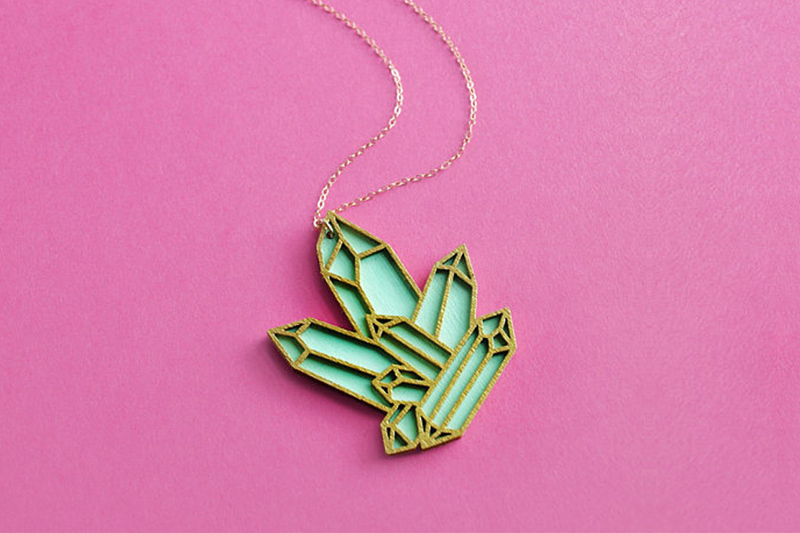 “My favorite materials are the gold mirror acrylic and fluorescent acrylic because they really let the line etchings show through, which are a key element to my jewelry designs,” she says. 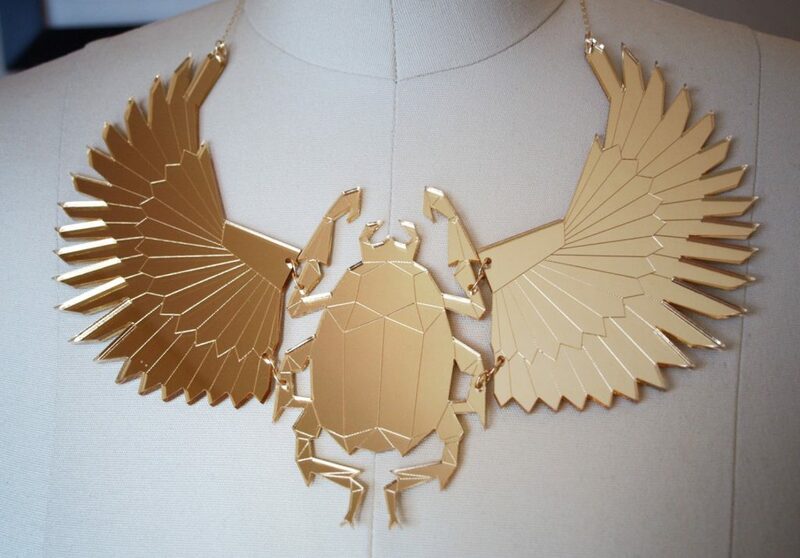 See what she means with this laser cut gold mirror acrylic statement necklace. 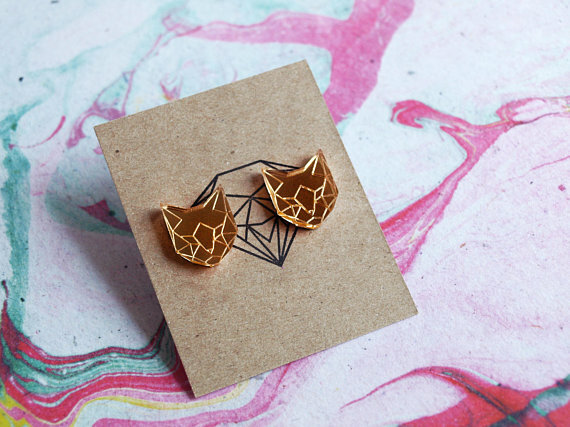 Are the geometric shapes origami inspired? Or perhaps two fighter planes in formation? Maybe there’s even a hint of a Star Trek emblem? We’ll let you decide. 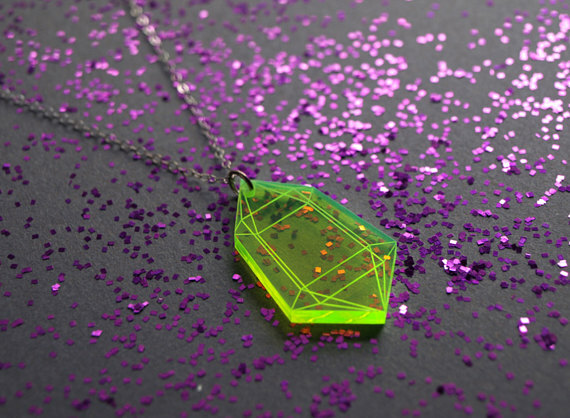 Laser engraving is what makes this fluorescent green acrylic crystal pendant a head turner. The etchings create a transparent 3D effect, but the pendant is actually one-dimensional. And when the light hits it just right, it appears to glow. 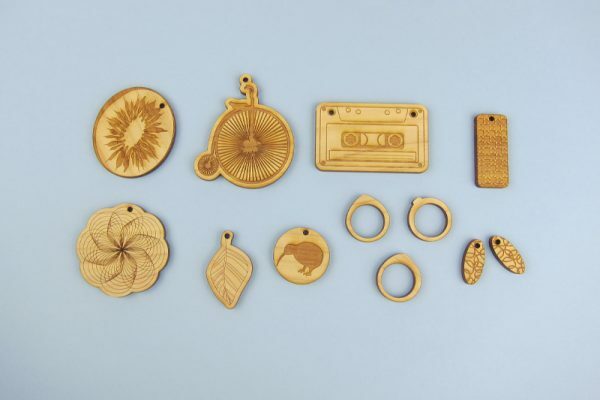 Rachel says that she doesn’t like limiting herself, so she’s always exploring new materials such as with this laser cut wood pendant. 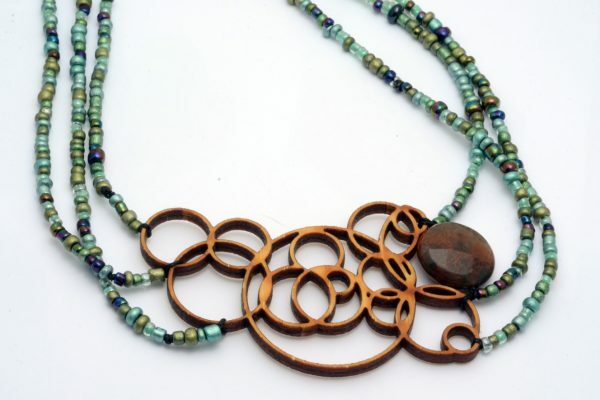 It is made with layered laser cut wooden pieces that have been hand painted with acrylic paint. The base color is lavender and the outlines are painted with a metallic rose gold. The whole pendant has been sealed with glossy acrylic to preserve the colors. Finally, the pendant is fitted with 14K rose gold findings that glimmer in the light and really gives this piece a luxe look. In addition to her affinity for insects, Rachel says you’ll find cats, Japanese culture, and space reflected in her pieces. 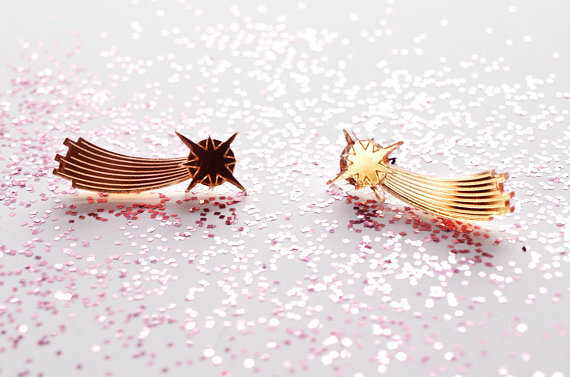 Hey, if a little galaxy jewelry won’t put a twinkle in your eye, what will? 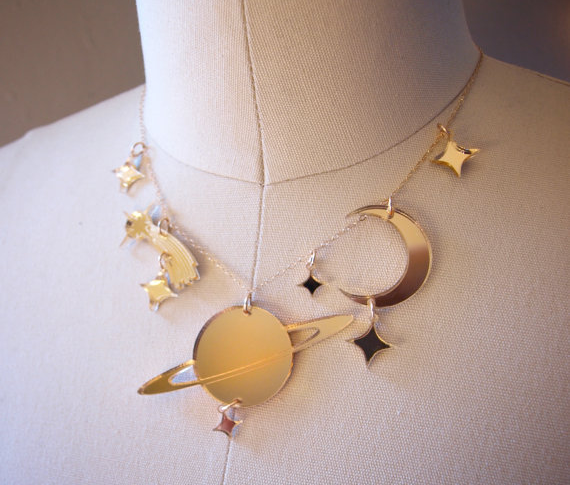 When designing geometric jewelry pieces for Galactic Affair, Rachel says she wasn’t into metal crafting or anything super intense that required a bunch of specific tools, as she never really had the space or money to try out those things. So she began looking for alternatives. So how did she choose Ponoko? 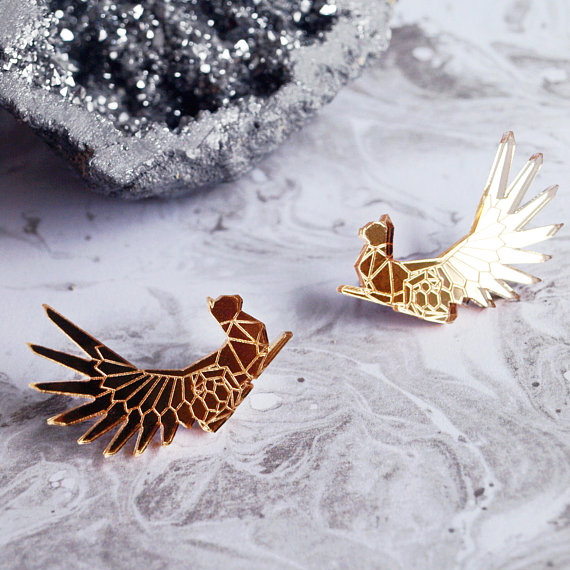 “I initially looked into local laser cutting places, but being the typical millennial who prefers to shop online, I stumbled upon Ponoko. 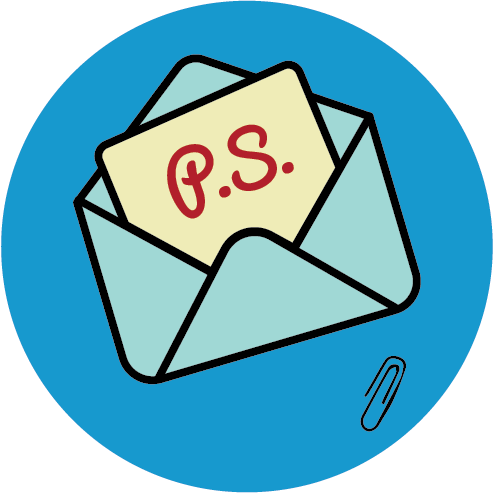 I found the pricing to be really fair and extremely friendly toward my budget,” she says. To make the most of her budget, Rachel has to be smart not only with how she designs each piece but also how she arranges these pieces on the material sheets to maximize yield. This is where cost savings techniques such as nesting and shared lines come into play. What’s clear about Rachel and her vision for Galactic Affair is that there is much more to it than simply selling jewelry on Etsy. She also has platform for making a difference. Rachel supports organizations such as Electric Family, which is an EDM lifestyle brand that brings the community together by making the world a better place. Additionally, animals have a special place in her heart. 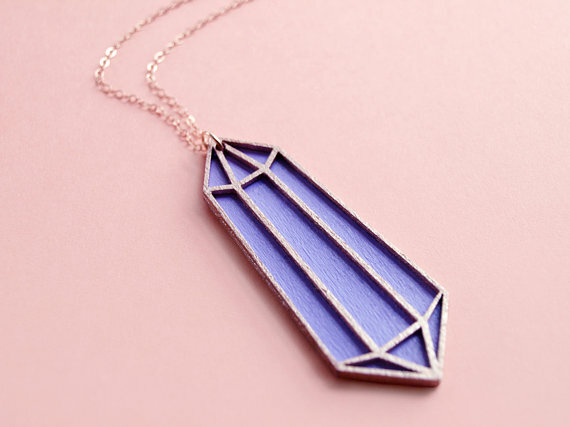 Overall, what impact does Rachel want to have through her small business of selling Etsy jewelry? “I want Galactic Affair to be a brand that represents people who wish to express and empower themselves as well as join the revolution against fast fashion,” she says. “There are so many corporations that put out hundreds of thousands of products for the cost of a fast food meal while ignoring their long-term impact on the environment and poor ethical practices. To learn more about Rachel and keep up with what she is making at Galactic Affair, check out her Instagram and Etsy shop.